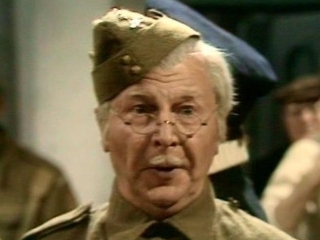 It’s a sad day today, when we announce that Clive Dunn has passed away at the ripe old age of 92. The English actor was most well-known for playing Lance-Corporal Jones in Dad’s Army, a British sit-com set on the coastline in World War Two featuring the Home Guard and all their adventures. There were air raids, bombs in need of detonating, and then the Germans invaded – and through all these times of crisis, Lance-Corporal Jones’ voice would ring out, “DON’T PANIC!”. In quieter moments, Jones’ enthusiasm for the army would come out in long complicated stories about his times serving in the Sudan or India. Goodbye, Jones. We’ll all miss you. You made us laugh for many years, and long may it continue.